Leias blogg Allt mellan himmel & scrap: TGF Showcase DT!! What a perfect way to start a new year!!! I've been bubbling inside for a while now and finally I can scream it out LOUD - I've been choosen for the new TGF SHOWCASE DT!!!! "It's RELEASE DAY at The Greeting Farm! We are SO excited too because not only are there a ton of new releases, there are a TON of new faces being introduced on the TGF BLOG! We are welcoming 8 new Design Team members to our "SHOWCASE" team, the team that will be carrying you through until our next round of previews in March. Our new SHOWCASE team will be bringing you lots of fresh ideas using our new releases and some fun tutorials and other special posts along the way. What's more? We have SIX new releases available in the TGF Store and a chance to WIN all six of them just for hopping and saying hello to our new PREMIERE and SHOWCASE teams. We hope you've enjoyed the last week or so of previews, announcements and are SO grateful that you are sharing in our excitement as TGF rings in the NEW YEAR! HAPPY 2012 everyone! Now be sure to head over to The Greeting Farm Blog to check out all of the FUN!" Here's my first card with the new super cute Miss Anya Garland. Don't ya love the cute heart garland? Oh your card is just darling, love the layout! Happy New Year! She is so perfect for Valentine's Day projects :) Happy New Year and Congratulations!! Adorable Card. Congratulations, can't wait to see what you create. Such a cute card! Love the colours. Congrats on being a new farmer! Love the card! Happy New Year! And congrats for tharting the new year with such exciting news! Beautiful card! The image is gorgeous! Hi Veronica! Congratulations on making the team. Your card is super cute! Hei - jeg hopper innom for å si "hallo"
WOW! Love this, so fresh and sweet! Just gorgeous gorgeous gorgeous! Love it! A gorgeous card. Happy New Year! congrats on being a showcase designer for TGF ! Absolutely gorgeous! Love your creation with this new Miss Anya. Great card, she is adorable! Great card! Anja is so cute. What a super cute card! I LOVE the layers and colors that you used. Also CONGRATS on making the DT! How fun! Oh I like your check box, it adds to the image perfect. Congratulations! This is a lovely card. I really like the papers and colors you chose. Lovely card and I love the new image! I know you must be sooo excited to be part of TGF's Showcase Team. Congratulations!!! It truly is an honor isn't it? Thanks so much for sharing this FANTASTIC card with us today. What an absolute doll she is. I love your papers, layout, and of course your gorgeous coloring. Fab card! Congrats and welcome to the Farm family! This is just too cute! I love it! Huge congrats on making the DT too! Congrats, Veronica! Love your cute card! Great colors and design! Congrats on making the DT.. I agree this new set is just too Cute.. I love these girls. Great job with your layout. Oh, what a cute Valentine! Congrats on being a designer. Super pretty job on this Anya. I really like your use of the "You Make Me" card as an addition. Congrats on your DT with the Farm! 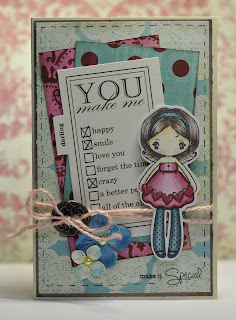 Your card and image is adorable, love the layering and coloring! Beautiful card. Love the design!! Oh, that is such a sweet card! Congrats on your DT position and Happy New Year to you! Love your beautiful card & the sweet heart garland. Congratulations for made it to the Showcase DT Team!!! Go girl!!! Lovely card, these Miss Anyas are so lovely!!! Very sweet. Love the delicate colors! Super sweet card! Congrats on the DT! Congrats on becoming a part of TGF family. Such a sweet card. Congrats Veronica! Your card is gorgeous! Adorable!! I love the layers and pretty papers. I can't wait to get the Anya's so cute!! Your card is beautiful and that image is so sweet! Congrats on the DT position! Congrats!! Great card, love the senti! Congrats on the DT position! Could this little lady be any cuter? I really like how you paired her with that checklist - so clever! Super looking Miss Anya card. love your card. super cute!!! Sweet image and great layout! Happy New Year and Congrats to you. Veronica - Congratulations on being selected as a Showcase Designer. I love all the details you used on your card! :) Looking forward to seeing your creations this year. Now I can officially congratulate you, Veronica! :D Congratulations on becoming a Farmer! I love the chic feel of this card. Looking forward to working with you over the next 6 months. Wow, Veronica, what a STUNNING card! I'm so excited to be working with you on the new TGF Showcase DT and can't wait to get to know you better! WELCOME to TGF! I am so excited to have you on the team! BEautiful card and layout! Helt underbart! OCH helt välförtjänt!! !